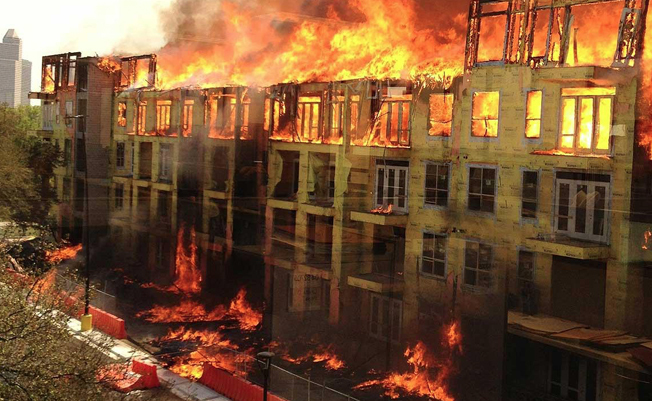 Multifamily Developers Being Attacked By Arsons, Now Have A New Award Winning Fire Elimination Program To Help Lower Risk Of Loss and Litigation. when the rest of the building is raw dried lumber fuel. MIGHTY FIRE BREAKER™ Applied Science Job-Site Fire-Inhibiting Documented Job Site Spray Service works to reduce uncontrollable fire risk outbreaks and loss of complete wood structures and lives, in several different and significant ways. (1) Mighty Fire Breaker™ Applied Science UL Certified Clean Chemistry works to reduce fast fire ignition time on raw fuels like lumber while reducing the biggest killer smoke to make firefighting safer and easier with much less loss by removing a Fires ability to gain an uncontrollable pace that even water can not slow it down. (2) Mighty Fire Breaker™ Applied Science Clean Chemistry works to reduce the rate of spread of fire on stick built and CLT mass timber buildings during construction and also in completed occupied buildings to make rescue and exiting safer for brave firefighters again with less loss because of less pace even in a dry attic. (3) Mighty Fire Breaker™ Applied Science Clean Chemistry works to reduce the rate of smoke development during fire ensuring lower risk to the lives of occupants, fire fighters when other fuels are burning the defended lumber is not contributing to the acceleration of loss. (4) Mighty Fire Breaker™ Service Network is now supported by mobile computing systems running Mobile App. Our APP operates to capture, store and document, each and every step taken along the multi-step process, starting from the point of placing the Purchase Order (PO) for Mighty Fire Breaker™ Service on a specific Building Site. All quality assurance steps are documented from the blending in our QAI audited quality assurance program with of chain of custody to each job site without any interference of our sealed QR coded pals right into lockdown secured storage containers on site. At the Completion of the Fire-Treatment Application every building unit is than recorded for shared login data to stakeholders i.e. Builder, Fire Chief and Insurance Provider with True and Accurate Real Time Data. Our goal is to convince the Fire Capitan on site that as he looks up to see a building on fire even after arson attack he is looking at a fire that is struggling. Then when he can look at the data on his IPad or phone he can put two and two together as to why it’s struggling. At that point we are expecting and hoping he sends his firefighter in to mop up because he is confident there lives are not at risk the way they would be normally in a raw lumber building under construction. This Years ENR Award Celebration will showcase as one of the award winners the best fire elimination plan the building industry has ever seen. The top 25 newsmakers and the best project teams will be introduced to the newest best practice for wood framed buildings that includes the cleanest safest fire chemistry on the planet.